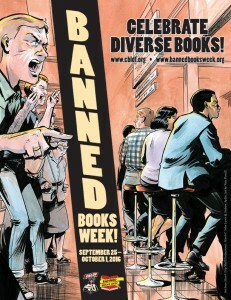 Celebrate Diversity with CBLDF’s Banned Books Week Events! Banned Books Week starts this Sunday and runs through October 1! Celebrate the freedom to read and this year’s theme of diversity with CBLDF during events in Portland, Las Vegas, and Ohio! Why are so many diverse books banned? Every year the library celebrates Banned Books Week and the freedom to read. Banned Books Week is an opportunity to call attention to the books most frequently targeted for censorship. Increasingly, books by diverse authors or about diverse communities wind up on the list of most challenged titles. Comic book authors M.K. Reed (Americus), Jonathan Hill (Americus), Anina Bennett (Boilerplate), Tristan Tarwater (Hen & Chick) and editor Hannah Means-Shannon (Dark Horse Comics) will discuss this trend and express a vision for how greater inclusion means a stronger future for intellectual freedom. This panel discussion is presented and moderated by the Comic Book Legal Defense Fund Executive Director Charles Brownstein. Fight censorship and celebrate your freedom to read during Banned Books Week, September 25 - October 1. Every year, there are hundreds of attempts to remove books from the shelves of bookstores, libraries and schools. Join us as Las Vegas Review-Journal Political Columnist Steve Sebelius and our panel of educators and experts — including CBLDF Board Member Katherine Keller — discuss the current state of censorship in Nevada. In addition, Cockroach Theatre will present staged readings of challenged and banned books. A reception will follow the reading. If you are hosting an event or Banned Books Week display, let us know about it! Register your event with Banned Books Week at http://www.bannedbooksweek.org/events and send an email to betsy.gomez@cbldf.org. CBLDF is an official sponsor of Banned Books Week. Banned Books Week is also sponsored by American Booksellers for Free Expression, American Library Association, Association of American Publishers, Association of American University Presses, The Authors Guild, Dramatists Legal Defense Fund, Freedom to Read Foundation, National Council for Teachers of English, and People for the American Way Foundation. Contributors include American Society of Journalists and Authors, National Coalition Against Censorship, PEN America, and Project Censored. Banned Books Week is endorsed by the Center for the Book at the Library of Congress. CBLDF’s education program is made possible with the support of the Gaiman Foundation and CBLDF’s Corporate Members — ABRAMS, Black Phoenix Alchemy Lab, BOOM! Studios, comiXology, DCBS, Diamond Comic Distributors, Dark Horse Comics, DC Entertainment, IDW Publishing, Image Comics, Half Price Books, Oni Press, Penguin Random House, ReedPop, TFAW.com, Scholastic, SPX, Valiant, the Will & Ann Eisner Family Foundation — and members like you. Thank you!